Compared to all the MUVs present in the country, the Toyota Previa has a unique stance and positioning of its own. The reason for this unique identity of the Previa goes to its quirky yet functional design, which is curvy from whichever angle you see it from. While the exterior design of the Previa looks simple yet distinctive owing to its curvy design language, the interior cabin of the Previa looks a bit disproportionate and dated. However, talking about the cabin, it is one of the most spacious places to be in. Toyota has equipped the Previa with a 2.4-litre 4-cylinder petrol engine, which is coupled to a 6-speed automatic gearbox and pumps out 168 PS of power and 223 Nm of torque. Have a question on Previa? Previa is available in 7 different colors - Black, Pearl White, Silver Metallic, Super White, Deep Red Mica Metallic, Ice Titanium Mica Metallic and Dark Sherry Mica Metallic. Watch latest video reviews of Toyota Previa to know about its interiors, exteriors, performance, mileage and more. There are very little chances of an MUV to look individualistic and different from the crowd of other similar vehicles. However, the Toyota Previa feels like an exception. One of the curviest looking MUVs in the world, the Toyota Previa is an MUV for large families. In UAE, the Toyota Previa is being offered in two different variants – S and SE – and seven color options – Super White, White Pearl Crystal Shine, Silver Metallic, Ice Titanium Mica Metallic, Black, Deep Red Mica Metallic, and Dark Sherry Mica Metallic. While the exterior design of the Previa looks quite futuristic, the same cannot be said about the interior cabin though. The overall design of the cabin does look as unique as that of the outside of the vehicle, however, the layout of the things looks quirky, with dated features only reducing the desirability factor. The dashboard has quite a quirky layout, with a four-spoke steering wheel and a centrally mounted instrument console at the upper portion of the dashboard. While the layout does give the Previa a sci-fi effect, the design of the steering wheel, as well as instrument console, looks as if they belong to a vehicle from the last decade. Even the center console doesn’t seem fresh in terms of appearance, as the 2-DIN music system in the Previa could have been avoided for a more modern touchscreen unit. Also, the placement of the gear lever alongside the buttons for automatic climate control is something which might take some time in getting used to. However, thanks to the dual tone black-beige theme, faux wood inserts on the dashboard and door panels and large side glasses, the overall cabin of the Previa feels very airy. All three rows in the Previa pack in a lot of space. The Toyota Previa packs in some really nice features like powered driver’s seats, cruise control, leather upholstery, push-button start with keyless entry and automatic climate control. However, the list of features could have been longer. Compared to the conventionally styled block themed MUVs, the Toyota Previa looks like an exception with its curvy design making a style statement of its own. At the front, the Toyota Previa has got a minimalist looking front grille with a sloping down design for the front bonnet as well. 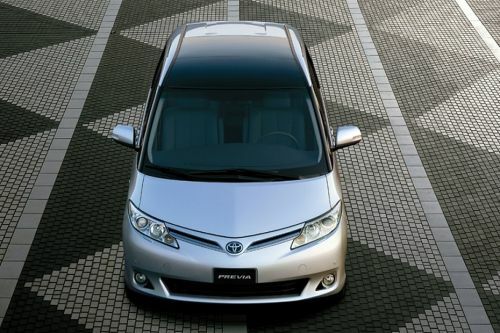 The sleek Y-shaped chrome grille comes with a dominant Toyota logo in between, which along with the presence of sleek and angular headlamps, make the front fascia of Previa look modern. The headlamps do come with projector bulbs within them, however, they do miss out on daytime running LEDs. The side profile of the Toyota Previa looks very much elongated, thanks to the short bonnet design and long wheelbase. The overall side profile design looks simple though, with a clean design for doors as well as alloy wheels. The sliding functionality for the doors and the large side windows enhance the practicality of the Previa. At the rear, the Previa looks in line with the modern lineup of Toyota SUVs, with a sharp and stretched out theme for the tail lamp assembly. Here too, the large rear windshield gives a big vehicle impression to the rear end of the Previa. Amplifying the advantages of generous cabin space in the Toyota Previa is the plush ride quality on offer. The MUV comes with Macpherson struts at the front and Torsion Beam at the rear, which has been tuned on a softer side. This suspension setup, along with 17-inch wheel setup, makes for a perfect balance of comfortable ride quality and agile handling. The Toyota Previa sources its power from a 2.4-litre four-cylinder petrol engine, which puts up 168 PS of maximum power output and 226 Nm of peak torque output. The engine is mated to a 4-speed automatic gearbox, however, a more modern transmission unit would have been better. As with all the Toyota vehicles, the Toyota Previa is decently equipped with commendable safety features, such as dual front airbags, ABS, tire pressure monitoring system, vehicle stability control, front and rear parking sensors. Here too, the list could have been a bit longer. The Toyota Previa, despite its age, manages to look fresh on the outside, however, the interiors need a refresh with added comfort and convenience features and a better layout. The MUV manages to perform its directed tasks of offering a generous amount of space and plush ride quality pretty effectively. What is the price of Toyota Previa? On road prices of Toyota Previa in starts from AED132,200 for base variant S, while the top spec variant SE costs at AED144,800 . What are the colors options available in Toyota Previa?